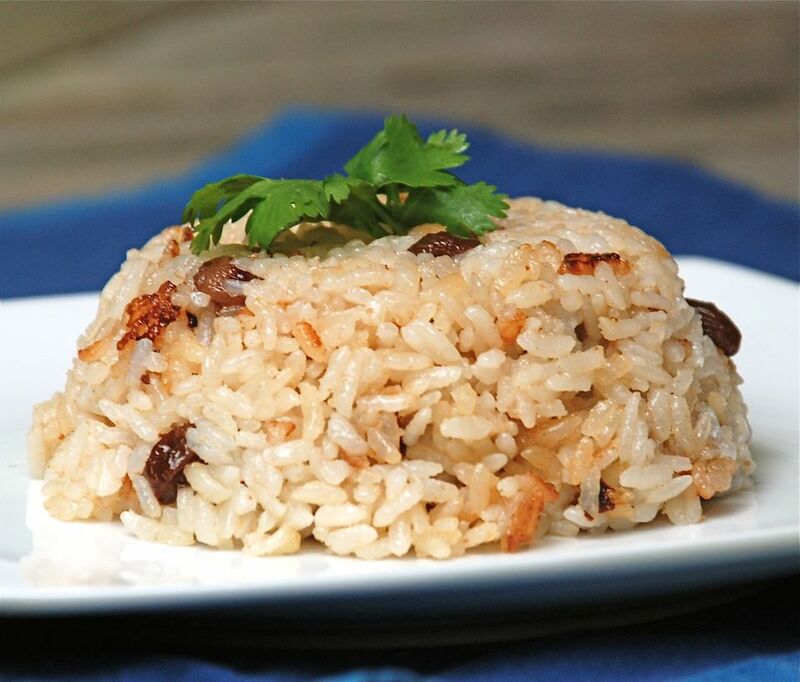 Coconut rice is a fragrant sweet-savory rice that pairs especially well with seafood. This particular method for preparing coconut rice comes from Colombia and involves cooking the coconut milk until it separates and the coconut solids start to caramelize and turn brown. The resulting rich toasted coconut flavor is then cooked into the rice, along with the delicious crispy bits of browned coconut. The raisins add a touch of sweetness, but this is definitely a savory rice. It's delicious served with chicken in creamy coconut sauce. Place the coconut milk in a heavy saucepan over medium heat and bring to a boil. Simmer the coconut milk, uncovered, until the liquid has evaporated and the coconut solids start to separate from the oil. Continue to cook, stirring constantly, until the coconut solids have turned a dark golden brown color. Stir the rice and the raisins into the pot with the coconut milk. Add the water, the salt, and the sugar, and mix well. Bring the water to a boil, then lower the heat and simmer the rice, covered, for about 15 to 20 minutes. Turn off the heat and let the rice remain on the stove for another 5 to 10 minutes, covered.